and as such it is considered a royal delicacy replacing the rarely met asparagus. 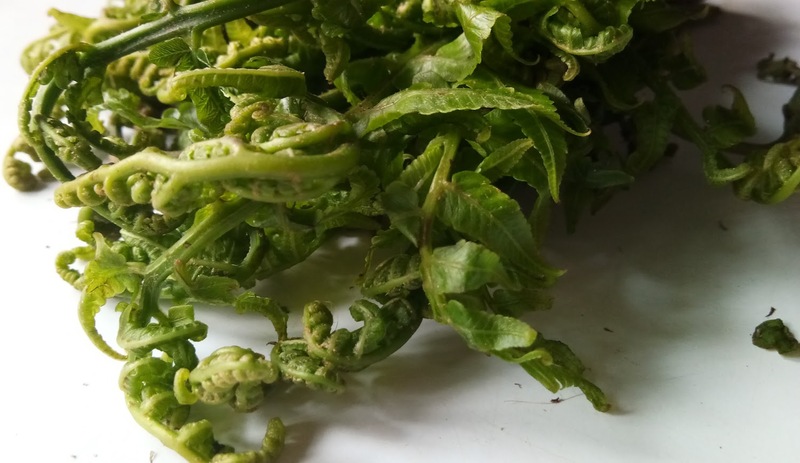 Niuro – as it is called in Nepali – belongs in the category of vegetables to the deciduous group and serves as many other types of greens for preparing saag. The recipe given below is not much different from the traditional Saag dish from Nepal. The difference is that it is a gentler way of treating greenery. In order to preserve its delicate structure, it should be left and only stalks on half and treated for a short time at a high temperature. I cut them little bit more to make them more friendly for children. Clean the fiddlehead from the rubber coating by rubbing it in your hands. Cut each cross across half and rinse under running cold water. Put the paprika in boiling salted water and blanch 2 minutes. Then drain and set aside. Finely chop the garlic and onions, cut the tomato into small cubes. Heat the ghee in the pan. Add garlic and fry to a golden color about 2 minutes while stirring. Add onions and fry for about 3 minutes to a golden color. Add tomato and fry till the juice evaporates. Add the paprika, salt and fry for about 2 minutes. Add lime, sprinkle with minced pepper. Serve with the addition of basmati rice.